One of the distinctive features of a tortie is her strong and forceful personality, which is often known as ‘Tortitude’. Although there is no scientific evidence to support this, Tortoiseshell cat owners will usually have plenty of Tortitiude stories to tell if you give them a chance! 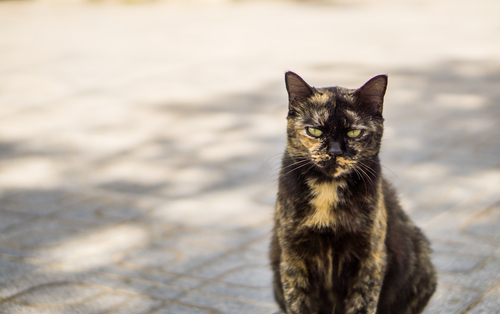 Torties are very possessive of their owners, and will often greet them when they come home from school or work with a raised tail and a demand for strokes and lots of attention, often accompanied by a loud purring. If her tail is raised, then this is a form of greeting so make sure that you give her plenty of cuddles and she will probably follow you around the house for a while. She will be particuarly interested in the weekly shopping or any new purchases that you may have made, and very keen to get in the shopping bags! Tortitude usually means that your cat will get what she wants, or she will certainly do her best to get your attention while trying. She will also probably be very bold and curious – she will want to know what is going on when any visitors come to the house and will be keen to help the delivery men or anyone trying to read the gas meter! But tortitude can also mean that it feels like your cat has a split personality, she can be sitting on your lap enjoying your company and then suddenly turn and attach you for no particular reason. Tortitude is part of what makes us love Tortoiseshell cats so much and makes them an important part of the home – we wouldn’t have it any other way! What do you think about Tortitude? Does you cat have it? Let us know your Tortitude stories. I have the sweetest cat named Roux who is 8 and I love her to pieces. She is always by my side wherever i go. in the morning when I put on my make up, she sits next to me and occasionally gets up on her hind legs, puts one paw on my knee and reaches the other one up toward my face until i give her attention. When i get home everyday she greets me at the door like we are meeting after years of being apart. She talks constantly and i, of course, respond. She does figure eights around my legs basically tripping me every time i walk anywhere. While i’m cooking she will stand next to me and wrap her tail around my leg like a hug. When i clip her nails she goes totally limp in my arms and wouldn’t dream of scratching me unless we are playing and it is on accident. She is basically perfect. i couldn’t ask for a better cat. I live alone with a tortie named Scout. She is a petite miss who’s kept her figure at age 15 but is threatening to drive me crazy. She has always been exceedingly vocal and made me puzzle at times what she wanted, but lately she has got into low-volume chirping and yowling for hours at a time. The only way to shut her up is to pick her up and pet her, and I can’t spend the entire day doing that. She seems healthy as ever but good grief! I don’t know if it is aging or boredom or impatience at the long Canadian winter but she’s become an intolerable complaint machine seemingly unable to amuse herself. . Any ideas out there? I’m kind of going through the same thing. I adopted my Tortie a couple years ago and the very first night she was awful but I figured she’s in a new place and is probably scared and now about 2 years later she’s starting again. She doesn’t allow us to sleep she bangs and cries at doors until you get up and sit with her. If we leave the door open she tears at the bedding and clears off everything on the dressers and tables. Once I get up she ignores me. She doesn’t have any health issues. She’s never been affectionate so you can’t hold her to calm her down. She’s got plenty of toys and I try playing with her but she likes to play alone. She also is very destructive. She pulls things off of walls and when she uses the litter box she scratches at the walls instead of using the sand and she will bang around in there until I go and take her out. I’m not sure how to handle her and am very tired. I’ve never had a cat that had been this bad. I adopted my first tortie about 3 weeks ago! My hubby and I went into a Petsmart to look at some stuff and they were having an adoption event and this cute tortie was there. Her name is Elle and is about a year old. We also have 2 other cats. Elle definitely has Tortitude and had attached herself to me. She hisses and growls at the other two especially if they get close to me. And one minute be just as sweet then swipe me with her claws. I can tell this is a tortie learning experience. Hopefully she will mellow some but she adds character and gets lots of love like the other two. I have a female long haired tortoise shell and a white/orange male tabby. They are like 2 different species. Anabel, the tortie, has been trying my patience ever since I got her at 8 weeks old. Sometimes her tortitude is almost more that I can handle! She is 5 1/2 years old now and just when she started to calm down a bit, we got a big yellow Labrador Retriever and she resents this so lately she has resorted to being a pain again. Unless she is asleep, she is only interested in doing things that are strictly off limits. (climbing in computer wires, chewing things, scratching furniture instead of the dozens of scratch pads I have all over for that purpose, etc, etc.) But I love her and I cherish the good times I have with her. Torties are definitely different!!! I have a 3 year old tortie, Minnie, and let me tell you! She is definitely the poster kitty for Tortitude! Minnie’s mom is also mine, so when she gave birth, and Minnie popped out, I just fell in love. This cat has helped me through severe anxiety. She sits on my lap, sleeps on my chest (when she can sneak into the bed with my husband and me), follows me to the bathroom, and stands there waiting for me to finish showering and will even try to make me jealous if I don’t give her the attention she seeks. lol She also freaks out if I’m upset, crying, or laughing too loud. She attacks my husband if she thinks he’s hurting me too lol I have never had a cat that loved me the way my Minnie does, and my tortie is the best four legged friend I could ever have asked for. Well, Peanut sprang from carrier like a pinball, and didn’t slow down for about 3 years. She’s almost 8 now, and among the most ballsiest, most possessive cats ive ever had, who will kick the pants off cats twice her size but welcomes all the attention she can get from dogs & people. My tortie is my life. The first time I met her I had come in the door, heard a thunk of feet and heard a little crazy thing come barreling at me, ran up my body, kissed me on the lips and ran off, not to be seen again for the rest of the visit. I believe in signs and wondered if this was the start of a significant relationship. Her name is Belle. She is my sidekick. When I was bedridden for months she only left my side to use her box and eat. She senses when I’m sad and will comfort me. She trills all the time. When she got here she was one of many. As time has gone on she is an only child. She has taken on the jobs of her siblings who have passed. She escorts me outside and lounges at my feet like our dog did. She decided to become closer to my husband when his animal friend passed. She is the most charming animal I have ever known. She will look at me upside down, with the cutest expressions. She doesn’t like to be touched by anyone else unless she wants it. I have had many cats, but this one is the closest cat to me that I have ever had. After many years of loving the Siamese breed, I am happy to report that this little tortie has made me a convert. In 1996 I rescued a young torti from an abandoned house in St. Marie, Montana. I had intended to take her to a shelter after getting her shots and nursing her back to health. But when I got her back to my apartment in Seattle, she started attacking me at random moments, and I was worried she’d never get adopted. I never gave her a proper name… Kitten passed away 3 years ago at the age of 18. Today I found a starving torti on a side street in Superior, Montana. She is so light I almost tossed her when I picked her up. She is badly matted and it looks like the tips of her ears froze during the recent sub-zero weather. Tomorrow I am taking her to the nearest vet (60 miles), and hopefully she will be okay… and she will get a real name. I’ve had several torties, all very special, but your comment reminds me of a real wild tortie I adopted from the Cat’s Protection League, who wouldn’t come anywhere near me, crapped wherever she felt like, cowered under a bed during the day, but came out and ran around like a maniac at night when I was trying to sleep! One day I’d had enough, she’d crapped in the lounge again, so I chased her around the flat until I managed to catch her. I held her by the scruff of the neck, and suddenly she started purring. Of course instead of telling her off, which is what I had intended, my heart melted and i started to talk to her and stroke her. She gradually relaxed, and from that moment on, never left my side, even outside for a range of about half a mile. She went to the shop with me to get her cat food, even coming into the shop to take a look at what was on offer, and when I went to the chip shop she used to sit outside like a dog, waiting for me! I certainly do miss Roxy! I picked her up and she put a paw on each side of my face and started licking my face. I love her, but she has been a challenge! She has a bad temper and will turn on you with the flip of a coin. She is a one person cat and does not like my husband no matter how hard he tries. She will swat, hiss and charge him. It hurts his feelings. She loves to eat and is over weight but if you cut back on her food she gets more testy. She will charge my dog and scare him to death. I handle her personality by letting her have the upstairs to herself. When being nasty I will clap at her, which she does not like. When petting her and she is being sweet then flips, I look her in the eye and say sternly”Don’t bite me!” Which she knows that phrase well, she will get up and leave. But she’s mine and I love her! She is a free thinker and definitely not a pleaser! Hi, my torti is same. Some cats are just born high strung. Im getting her some phermon spray that suppost to relax cats. We’ve had 5 torties over the last 45 years, our latest one being Willow. She was born to a feral mum on the campsite where we spend our winters in southern Spain. Willow chose to “adopt” friends of ours on the campsite who had her neutered, chipped, passported and vaccinated with intention of taking her back to Scotland with them. Circumstances changed and they were unable to take her with them, so asked us if we would take her with us when we went back to our home in France for the summer. She’s now settled and happy with us, having a summer home in France and a winter home in Spain. You would never know she started life as a feral as she is so loving, loyal, playful and keeps us laughing with her mischievous antics. Like many torties she’s very vocal, joins in conversations and certainly likes to have the last word. we recently saved a feral 7 month old tortie , who was born in the rocks on our property, we had her spayed and have been trying to litter train with no luck, do you have any suggestions? Probably a bit late now, I’ve only just come across this site, how are you gettting on with that? For anyone else reading this, my advice is to wait for her to crap, then put it in the litter tray then (after thoroughly cleaning the place she went and putting pepper dust on it) show her the tray with her crap in it. Torties are very intelligent and she should get it. Also, she may not like whatever is in the litter tray, so if you’re still struggling, try something else. We “rescued” a 12 year old Tortie called Buffy recently, as her owner had had to go into a nursing home. This owner had had Buffy since she was two, so Buffy had other owner (s) before that. It would be lovely if she could talk so that she could let us know about her life before she came to us. Her last owner had obviously adored this cat as Buffy came with her own larger than life size portrait and a self portrait cushion and lots of toys and blankets. Now first of all, Buffy was very quiet and not eating much, but after a couple of weeks she found her voice and is definitely displaying the Tortie attitude described here. She is very affectionate and has attached herself to me as her new favourite, but on her terms only. Our other cat is a Norwegian Forest Cat cross, and although she is bigger than Buffy she is terrified of her – she is a very timid cat and Buffy thinks she needs to keep chasing her off. Hopefully they will get used to each other soon because we love both. Have two tortie sisters we got from a rescue shelter. My wife never had cats before and did not realise it was possible to love animals so much. Typical torties. Compared to the only other cat I had (a large very affectionate and friendly female ginger) these two are much more energetic, playful, funny, wild, wilful and inquisitive. They have more attitude and are affectionate but only on their own terms. They do not like strangers at all but give them a piece of chicken and they will love you for life. One of them is very intelligent, big and powerful and a great rat killer. They other is always crazy to go outside and loves to try to kill my arm. She is the cutest thing ever and not as bright as the other one, but she is nobody’s fool. They always seem to copy each other and it is so nice to see them curled up together in identical positions. If they are in the mood, they will follow us everywhere, mainly to watch what we are doing and try to “help”. I think torties are just typical female non-pedigrees, hence their personalities. They are the quintessential “cat” cat, probably quite close to their wild relatives. To display a tortoiseshell coat pattern needs a good genetic mix, hence their hybrid vigour and strong personalities. I have three cats, one of which is a very… interesting one. I just learned today what “tortitude” is, and it does seem to fit her well. She puts pipe cleaners (her favorite toys) in the food and water bowls, paws at the water in the water bowl until it spills all over the kitchen, shreds up the toilet paper in the bathroom should you leave it unattended, has quite a range of vocalizations, will beg for you to turn the sink faucet on so she can drink out of it, and tries to dominate over my other two cats, one of which is much older, stronger, and larger, and could probably throw her down if he wanted to. There was this one time when, while we were away from the house, she evidently grabbed a roll of toilet paper from out of a cabinet in the bathroom, took it all the way across the house to the kitchen, and stuffed it *perfectly* in the water bowl. And if she ever escapes the house when you open the front door, she vigorously rolls around on the doorstep as if to rub it in your face. I adopted my three-year-old tortie from a local shelter about six months ago. She’s actually my first cat! My mother jokes that if not for the fact that I didn’t have the heart to change her name, she would have been Princess for sure, both because I spoil her and because she’s a little bit of a diva. So I’d say she definitely has tortitude! She’s a very good girl and I love her dearly, but it’s a good thing she’s my only cat because I don’t think she’d take well to having to share me, and that she is kept inside where she can’t decimate the local bird and small mammal populations. Kami, my extremely long-haired tortie has such a sweet personality, an even temperament and never turns on me. She adores me, loves to fetch practically anything, and snuggle. She has a toy box and will bring me things to toss so she can fetch them. She brings them to me in the kitchen, the bathroom, and while I’m in bed. It’s adorable. Last year on Mother’s Day, I found 18 toys in the bath tub when I got up. She must have been quite busy during the night. It was hilarious! I treated them like Mother’s Day presents! Tortitude is real. I adopted my first tortiseshell cat about five months ago and she owns me rather than the other way round. I joked she’s bioplar. She has those mood swings where we are kissing and loving on each other… then … she bites HARD! and skins back her ears as if I’m her mortal enemy. She is also the neediest cat I’ve ever had. Demands constant attention from me.. but I can never get her to come when called. Usually, I’m talking to the back of her head. She’s also the nosiest cat. Into everything. I dread putting up a Christmas tree this year because it will become her personal project to scale the tree like Mount Everest… picking off every ornament on her way both up and down the tree branches. Been feeding a torti feral for around 8 months, recently caught her and got her spayed. After picking her up and attempting to release her she wouldnt budge, she now lives in my bathroom and is getting sweeter and sweeter (most of the time lol) Now i just have to get her used to my two 4 year old tabbies. the male stares at her when i crack the door and luckily no hissing as of yet. Named her Jessicat. Love the stories and cant wait for the tortitude. I too took a feral torti (a 6 mo old hissing furball) home and she lived for awhile in a large bathroom. A website called THE LUCKY FEW was a life saver in dealing with older ferals. I followed his advice and my hissing furball emerged 6 weeks later as Nala Marie and she is a love. Also have 2 13yr old kitties, a male Siberian, Zachary, who loves everyone and a female black and white, Prancy Sue, who is not crazy about Nala. Nala, however is brave and taunts Prancy every chance she gets. Love my kitties, but the little Tortie is a riot! My freya is a blessing and a curse. She absolutely adores me in a favorite servant kind a way and is 90 percent spaz and 10 percent chill. Very smart loves to be chased. She also has “small cat syndrome”. Nobody has had the courage to tell her she is wee. Sure she sees a Bengal Tiger staring back at her from the mirror. My tortie is the funniest cat ever. She keeps us laughing. She’s very devoted to me and is always on my lap or following me from room to room. She is such a fun cat. She won’t let any another animal become a part of our family. She’s very territorial. She is very aggressive while playing. I couldn’t imagine any other cat fitting into our family she’s crazy fun. My tortie is 10 months old and she is by far the craziest cat I have ever had. I love her more than anything. She follows me every where I go no matter how long I am home, she sleeps by my feet every night and sometimes acts like she can’t get close enough to me, will follow me into my bathroom and sit on the sink next to me and when I am in the shower she is darn near in there with me. She never fails to greet me at the door and meows at me until I pick her. I can meow at her and she will meow back at me. Her favorite thing ever is fetch. She can play fetch for hours upon hours. She will bring her toy to me and meow at me until I take it from her and throw it. She also learned how to flush my toilet, so she will do that then sit in her litter box when her litter box gets too full and she wants it to be cleaned. She is the best cat I have ever had. I have yet to have her attack me at all. She only bites me and scratches me when I am playing with her with my hands instead of her toys. When my boyfriend came over to meet her, she was definitely unsure of him. She saw how we acted together and wouldn’t leave my side until she knew he was a safe person for me to be around. She is like that with every new person that comes over. As soon as she feels they are safe, she will act normally and even play with them. Definitely a cat I would consider having more of. She also loves playing in water. Whenever I take a bath she sits on the edge of the tub and plays in the water. My Kami also brings me toys to throw all the time. Sometimes if I don’t respond, she’ll bring others as if she’s thinking I must not like the first one. She also plays with her toys in the water bowl and has no problem sticking her face in the water to take them out. She’s a hoot! I have a Tortie . nou i have had since she wasSister a kitten. Minou actually chose me some how she managed to climb up my shoulder at the human society at three months old. My parents have a little kitty named Minou as well! She’s about 7 I think & she’s actually a munchkin cat. Long, thin, grey hair. The tiniest little thing I’ve ever seen. Get a spray bottle. My parents had troubles with one of their cats biting. Spraying them with water is a quick way to get them to stop. Also try a lot of toys, like squishy ones she can pick up with her mouth. Something she can carry will help the biting and she may play with that instead of your hands. Never use a water spray- see Jackson Galaxy on why not. My torte loves me so much, she will cry for me to sit down so she can sit on my lap and go to sleep. I was the first one to touch her when she was 2 weeks old, at 6 weeks she was climbing up my pants leg to by by me. My tortie certainly has tortitude. She is into everything and quite “psycho” (vet assistance term for her). She greets me at the door and wants picked up. She rubs her face on mine then out of no where, bites my face. She attacks me when I sleep. She bit my hip when I was on the toilet. She does a lot of the bite and run thing. I have never had a cat like her. I had a diluted tortie and she was the most loving cat I ever had. Now, I don’t doubt that Spooky, my tortie kitten, loves me but she has an odd way of showing it. She tore all of my house plants up from their pots then laid in them all snuggled up. She takes my organizer from my purse and then curls up inside my purse and won’t get out. I have no sink stoppers left because she has stolen them all. She puts her toys into the toilet. Forget about the litter box. If it has one speck of pee she won’t use it that way and lord forbid there’s a turd in there. She let’s you know it by yowling loudly and holding her next toileting until it’s gone. My hands are tore up. My arms, legs and feet too. I love her but geez, I’m not sure what I got myself into. I was going to get another cat as a playmate/companion for her but i fear she would kill it. She is very jealous if I show any attention to anyone but her…with one exception. My 5 year old granddaughter, Alyssa, with a developmental delay. She can hold her, cuddle her or whatever she wants and the cat lets her do it and never strikes back at her. Not that Alyssa is mean to her but I believe that if Alyssa picked her up by the toes, she would let her. I do love this strange little furball. I went away for the weekend, though I had neighbors come over and she has a grey tabby buddy, Bee Bee bit me and fussed at me for about 4 hours when I got home. She is maybe 4 months old. Underfoot constantly I could hardly walk around the house. I finally wore her out with the laser pen and redid all the catnip toys. The grey tabby went outside to get away from her. Bee Bee is not allowed out. I love all creatures great and small. Just don’t understand why humans allow and are amused by feline aggression but would have a dog put down for the same behaviour. This is a little sad. Also all cat lovers out there (myself included) please keep your cats indoors between dusk and dawn. This helps prevents/reduce them killing our native wildlife. We do need small mammals and birds. They are a valuable part of our planet. This is THE most bizarre comment ever. We don’t allow and/or are amused by biting. If the do they get a tap. Same as a dog. However, a dog is of greater strength than a cat! Next thing, cats kill rats and mice – sometimes. Birds are generally tucked up themselves at night. Cats have been on this planet for thousands of years and small mammals are still here! As a “cat lover” you sure are hating on them. In Australia white men are an introduced species too…. One more thing. She also will get in our closet and sit on top of our clothes that are hanging up. Very strange. I have an 11 week tortie. I got her when she was 8 weeks. The first week she was very lazy n cuddly. Now she still cuddles with me but my girlfriend not so much. She beats up our other cat that’s a year n a half. They like to play but she always gets the best of him. She follows me out the door n is always there to greet me when I come home. She’s constantly getting into things investigating she even job into a full bath tub just to see what it was like. She didn’t like it too much.. I have a 6 month old tortie named Lola and she has plenty of tortitude. Up until I read this article I had no idea about “tortitude”. Everything mentioned describes her. She walks my husband to the door in the morning and is always at door when we get home. She LOVES to talk. We keep a spray bottle for when she is up on the counter or anywhere she shouldnt be. When we grab the spray bottle she will give us these little short meows. As if shes trying to apologize or talk us out of it. I’ve always had cats while growing up. Lola is Very different than any other cat and not in a bad way. My husband says we have the same attitude problem. I foster kittens for our shelter and I kept a tortie out of the first bunch, because she was always different and I was afraid she would not be adopted. I raised those kittens from when they were five weeks old for several months. Charlotte doesn’t like being picked up, she hogs the bed, she’s very affectionate on her own terms, and she can get hostile easily if interfered with. She’s very smart and has played fetch at times. Our shelter manager (over 10 years experience) says tortitude is a real thing and unfortunately these cats get returned a lot for being kind of erratic and standoffish. Also that it’s only the straight torties, not the dilutes or calicos or white-spotted mixes. I adopted a tortie 2 yeRs ago following the death of my much loved black & White Tom. My cat has no tortietude what so ever. She is the gentle lest cat I have ever met, she never scratches (unless it’s the carpet) or bites & loves a cuddle, she especially loves a belly rub. Like most torties she is very verbal when she wants to be. She is very lazy when it’s cold preferring to sleep all day but in the summer she will spend a lot of time outside where she is bullied by the neighbourhood cats – she is a down & out softie. i just adopted a 2 month old tortie and she’s already got alotta “tude”, she only sleeps under the covers, sleeps in late too, i left her buried today under the covers and she didn’t get up till like 3, i’m surprised for a kitten she just chills so much, its as if she just wants to kick it all day in bed watching Animal Planet with me. When i try to leave the house, she runs right in front of the door, so possessive! I had a cat for 19 years and i thought she was a little princess, but this one has made her princess title even more so, i’ve never had a cat look at me so adorably, it’s like insta-love. she’s such a sweetheart. after i lost my lost it was hard to think of loving another one, but this little tortie has done the trick. kudos. Our tortii kitten, Bella, has so much attitude. Our previous (late) cat’s pal, size of small dog, is terrified of her and she also has to be supervised closely as there is NOTHING she won’t eat. I could go on for ever! I can definitely relate. I have a ten year old Torti who is a bit hot tempered at times, but other than that, I have never seen a more loveable cat (to humans). She is an alpha cat and even though she is tiny, other cats twice her size are intimidated by her 🙁 . Like other Torties, mine is very talkative to the point where it becomes irritating at times. She demands attention all the time, so much that I can barely sit down without her plopping herself down on my lap. When I come home I am pretty much tripping over her because she is at my feet to greet me. Because I have had ten years with her I have come to know her moods and how to read them. When others go to pet her, I have to watch her because she gives a bit of a tell right before she is about to turn on someone HAHA. My 7 year old tortie can be a stroppy madam!! She likes to be involved in everything…even getting a bit curious when I am on the toilet!! She likes to know what is in all the shopping bags. She also likes to play with any newcomers into the house. However children scare her. Sometimes she only has to give me a look and I know not to approach her but other times she lets me lay on her like a pillow. When she doesn’t get what she wants she makes a whinging noise….oh and she hogs my bed and refuses point blank to move!!!! I have a 22month old tortie and she deffo has tortitude. Yes she loves getting inside carrier bags etc has to have her nose into everything even to the point she has to even look at what your eating . She is bit timid she runs when ever the door bell rings and hides till who ever comes in then she wants to know everything about them she doesn’t really like being picked up she tolerates it . Some of the things she gets upto she has a little rubber ball she likes to carry round and likes it to bounce on the kitchen tiles . If she has been told off she runs away making a chirping noise I call it back chat . She likes paying hide and seek in the bedrooms !! She comes running to me when I get home from work just like a dog she’s lovely . Hi Barbara, your tortie sounds like she has tortitude just like our cat! She loves to get in the shopping bags when we get back from the supermarket and her favourite toy is a small monkey so loves to carry around the house! Let us know more of your tortitude stories..